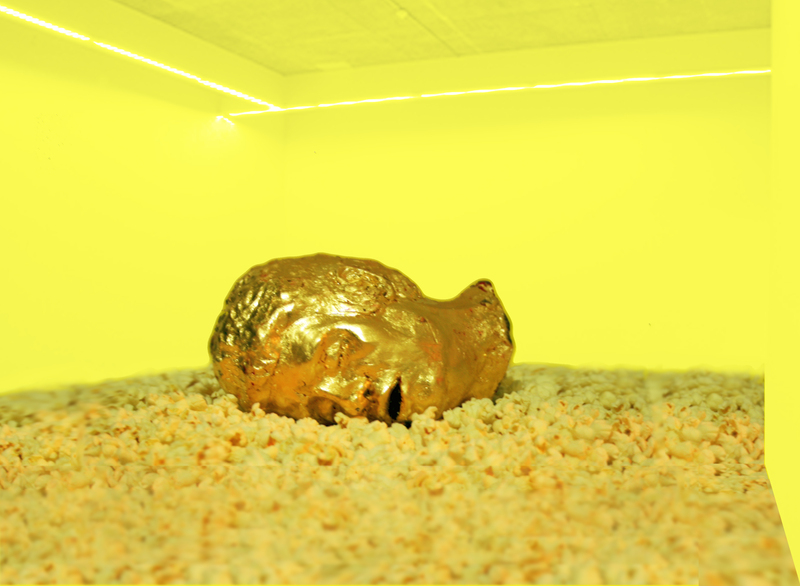 Rumble Arts Center proudly presents “El Principe” (The Prince), an original installation by Gil Rocha, on view in our storefront gallery from August 16 to September 7, 2013. We invite the community for an opening reception on **Friday, August 16, 2013 from 7 to 9 pm. ** This is a free event and is open to the public. Light refreshments will be served. Gil Rocha was born in Laredo, Texas and grew up on the border between Laredo (USA) and Nuevo Laredo, Tamaulipas (Mexico). He has a MFA from the School of the Art Institute of Chicago and a BFA from University of Texas at San Antonio. Rocha creates work that is “very unpredictable and process driven. [He moves] from drawing to writing to sculpture, installation, silence, painting, back to drawing, thinking, and again back to silence; and so on.” Rocha is an internationally exhibited, award-winning conceptual artist that often uses wordplay. Rocha’s work has been featured in exhibitions in the Museo de Arte Contemporáneo Alfredo Zalce in Morelia, Michoacán and Museo de Arte Contemporáneo Angel Zarraga in Durango, Durango, both in Mexico. Rocha’s solo exhibitions include ‘Contemplations’ (Chicago, IL), ‘614’ (Laredo, TX), ‘what she said’ (Laredo, TX), and a controversial censored show ‘y se abre el telon’ in which “eight artworks were on display outside the gallery during what should have been the ‘Gallery Opening Reception’” (Nuevo Laredo, Tamps., Mex.). Rocha’s work has also been included in ‘Territorio X’ (Léon, Gto, Mex. ), ‘Gil Rocha & Sam Romero: We are not related’ (Lakeland, FL), ‘TEXTURE. TEXT’ (Queens, NY), ‘Tarp ≠ Lona: 14th Annual Young Latino Artists’ (Austin TX), and the ‘Sister Cities Testing Boundaries Exhibition’ (El Paso, TX). Gil Rocha’s opening reception is a part of Insight Arts’ monthly cultural event series Nights of Insight. Rumble’s galleries are curated with the help of Insight Arts, a contemporary arts organization dedicated to increasing access to cultural work that supports progressive social change. Insight Arts is one of Rumble Arts Center’s core partners. Rumble Arts Center, located at 3413 W. North Avenue in Humboldt Park, provides an accessible cultural space that facilitates the empowerment and education of individuals and communities. Our Center provides for a variety of programs in arts education, exhibitions, and cultural events and free to sliding-scale program opportunities for all ages. Rumble, an independent non-profit organization, receives support from private and public sources including a grant from the Illinois Arts Council, a state agency. To view more of Gil Rocha’s work visit www.gil-rocha.com. This entry was posted in Openings and Events and tagged art, Arts, Chicago, Gil Rocha, Rumble Arts Center. Bookmark the permalink.